A tropical taste that is irresistibly good for you! The Gold kiwi fruit is an edible berry. Its flavors are sweet and tropical with notes of pineapple and mango. The entire fruit is edible. Gold kiwis can replace green kiwis in any given recipe calling for kiwis. They will have less acid-forward flavor, though which should be considered if attempting to using an acidic fruit to cut the richness of fats in dairy or meats. Gold kiwis can lend themselves to preparations both sweet and savory, cold and warm in cold soups, decadent desserts including pies and ice creams, granitas and fruit tarts. Gold kiwis bring a tropical flavor to salads and cocktails. Gold kiwis pair well with acidic and creamy fruits alike such as passion fruits and bananas, bright herbs such as mint and cilantro, nuts such as cashews and macadamias, and mild fruits such as apples and cucumbers. Within savory preparations, Gold kiwi can enhance many ethnic foods from Asian to Latin. Gold kiwis stand up well to the richness of stewed meats, avocados, the boldness of peppery flavors, chutneys and the aged flavors of sheep’s and goat’ cheeses. Gold Kiwifruit is a nutrition powerhouse fruit packed full of vitamins and nutrients – with high levels of Vitamin C and Vitamin E, Potassium, Folic Acid and Dietary Fibre. Gold Kiwifruit is also naturally low in fat and has a low GI (glycaemic index). this is a recipe that is very simple to make and requires little more than chopping the ingredients. I really like the unexpected use of kiwi in the salsa – it lends a nice but unexpected citrus flavor to the dish. It also pairs with the jalapeno surprisingly well. 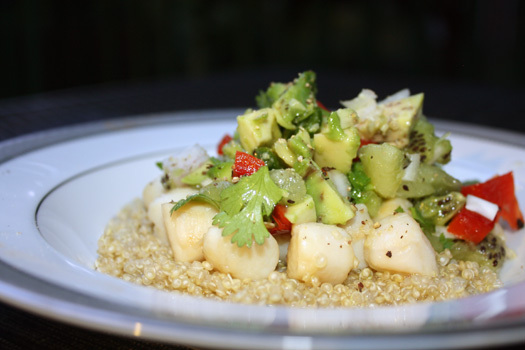 I served the salsa with bay scallops over quinoa. It doesn’t seem like scallops and kiwi would go together, but the butteryness of the scallops made the dish seem very rich and paired well with the cool, tangy salsa. If you don’t want shellfish though, I think this would pair well with almost anything – grilled chicken breast marinated in lime juice or a piece of flank steak would be fantastic. In order to get a good sear on your scallops, you need them to be very dry – not packed in a brine and then dried even more with some paper towels before you cook them. The scallops I used here were frozen, so a good sear wasn’t a possibility. In order to get a little bit of color on them, I dried them the best I could and dusted them with flour before frying them I a little oil. It wasn’t perfect, but it did give me a little bit of delicious browned flour flavor. Because of their rich green color, we don’t always think about green beans as providing us with important amounts of colorful pigments like carotenoids. But they do! Recent studies have confirmed the presence of lutein, beta-carotene, violaxanthin, and neoxanthin in green beans. In some cases, the presence of these carotenoids in green beans is comparable to their presence in other carotenoid-rich vegetables like carrots and tomatoes. The only reason we don’t see these carotenoids is because of the concentrated chlorophyll content of green beans and the amazing shades of green that it provides. Green beans (referred to as “string beans” by the study authors) have recently been shown to have impressive antioxidant capacity. Researchers now know that the list of antioxidant flavonoids found in green beans is not limited to quercetin and kaemferol but also includes flavonoids like catechins, epicatechins, and procyanidins. Researchers also know that the antioxidant carotenoids in this vegetable are diverse, and include lutein, beta-carotene, violaxanthin, and neoxanthin, as noted above. Green beans may be a particularly helpful food for providing us with the mineral silicon. This mineral is very important for bone health and for healthy formation of connective tissue. There is nothing better than string beans and wild mushrooms. You may substitute the wild mushrooms for any mushrooms that you can find fresh and organic. This dish is also ideally served as a salad! Bring a large pot of water to a boil. Add green beans and wax beans and cook until tender-crisp, about 4 minutes. (Cook for another minute or two if you like your green beans more tender.) Drain well. Meanwhile, heat oil in a large heavy skillet over medium heat. Add garlic and cook, stirring, until fragrant, about 1 minute. Stir in mushrooms and cook, stirring, until they release their juices and most of the liquid has evaporated, about 5 minutes. Season with 1/4 teaspoon salt and pepper. Reserve 1 tablespoon of the mushrooms for garnish. Add the cooked beans to the mushrooms in the pan and cook, stirring to combine, until heated through, 1 to 3 minutes. Season with the remaining 1/4 teaspoon salt and pepper. Serve topped with the reserved mushrooms. Substitution note: If you cant find wild mushrooms, use button, cremini, or shitake mushrooms. Although they are expensive, wild porcini mushrooms are the most fabulous of all! Tender-crisp long green beans tossed with creamy blue cheese and topped with toasted walnuts. This is another String bean dish that can be served hot or chilled as a string bean, blue cheese and walnut salad. Bring green beans and water to a boil in a large skillet. Reduce heat to a simmer, cover, and cook until the beans are just tender, 3 minutes. Uncover and continue cooking, stirring occasionally, until the water has evaporated, 3 to 4 minutes more. Add oil, salt, and pepper to the pan and cook, stirring, 1 minute more. Transfer the beans to a large bowl and toss with blue cheese until well coated. Sprinkle each serving with walnuts. To toast chopped or sliced nuts, stir constantly in a small dry skillet over medium-low heat until fragrant and lightly browned, 2 to 4 minutes. Bring a large pot of salted water to a boil. Add the green beans and cook until they are crisp-tender, about 5 minutes. Drain and rinse the green beans under cold water until they are chilled; pat the green beans dry. In a large bowl, whisk the mustard with the vinegar. Gradually whisk in the olive oil and season with salt and pepper. Add the green beans, tarragon, chives, and thyme and toss to coat. Add the tomatoes, toss gently, and serve. It doesn’t take much to upgrade a simple dish. Pair potatoes with string beans and add a mustard drizzle for a result that looks and tastes far from ordinary. And the preparation gets two vegetables on the table. When you’re working with only a few ingredients, it’s important that they shine. Use a good-quality white wine vinegar, and make sure the string beans are tender. Woody beans get even worse when roasted. Preheat the oven to 375 degrees. Have a large nonstick roasting pan at hand. Combine the potatoes and 2 tablespoons of the oil in the pan, tossing to coat evenly. Season with salt and pepper to taste. Roast for 15 minutes, then turn the potatoes over. Roast for another 15 minutes. Add the beans and toss to combine. Roast for 15 to 20 minutes, until the potatoes are tender and the beans are just starting to wrinkle. Meanwhile, whisk together the mustard, vinegar, the remaining 2 tablespoons of oil, the sugar, parsley and chives in a medium bowl to form an emulsified dressing. Season with salt and pepper to taste. Transfer the roasted vegetables to a platter and drizzle with the dressing. Serve warm. Makes 6 to 8 servings. Simply blanched fresh green beans are the best way to enjoy them, I think. Experiment with different herbs (marjoram or fresh oregano are also nice here), or including a chopped nut – almonds or hazelnuts go well. Bring a large pot of water to a boil and heavily salt the water. Blanch the green beans until bright green, softened a bit, sweet, but still slightly crunchy, a couple minutes. Taste one periodically. Drain well, then, while still slightly warm, toss with the shallots and herbs, a few tablespoons of olive oil, and taste to make sure you like them. Serve at room temperature. Give them a splash of lemon if you like just before serving to perk them up (or use a quality white wine vinegar instead). Cut beans into 1‑inch lengths; set aside. Saute garlic and onion in oil in skillet until soft. Add tomatoes, salt and pepper, and cook 2 minutes. Stir in basil and green beans. Cover, reduce heat to low and simmer 3 minutes. Remove from heat, stir in parlsey, and serve immediately. Makes 4‑6 servings. 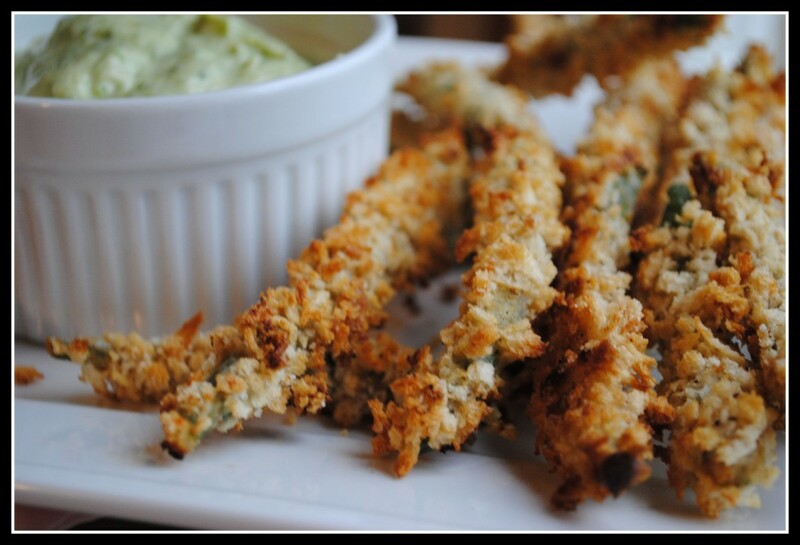 Baked Green Bean Fries with Basil Aioli – wow! Result: Creamy and flavorful and packed with healthy fat. The perfect dipping sauce for your low-calorie baked treat. This would also be great as a dollop on mashed potatoes, on meat, etc. Delicious! Enjoy! ‑ With Butter & Lemon Juice: toss beans with butter in a hot frying pan. Sprinkle with lemon juice, and season with salt & pepper. We find that green beans respond better to boiling than to steaming. A pound of beans in a standard steamer will not cook evenly. Boiling is simpler – just add the beans and cook until tender – and permits the addition of salt during cooking. Unlike other vegetables, green beans do not become soggy when boiled, because their thick skins keep them crisp and firm. Leave beans whole when boiling; cut beans will become waterlogged. Boiled beans can be flavored with some butter or oil, dressed with a vinaigrette, or sauteed briefly in a flavorful fat. Bring 2 ½ quarts of water to boil in a large saucepan. Add beans and salt and cook until tender, about 5 minutes. Drain and season. Dress the beans with a drizzle of extra-virgin olive oil or a pat of butter as well as a generous sprinkling of salt and pepper. Fry bacon in large skillet over medium heat until crisp, about 5 minutes. Remove bacon from pan with slotted spoon and drain on paper towels. Pour off all but 2 Tbs. bacon drippings. Add onion and saute until softened, about 5 minutes. Meanwhile bring 2 ½ quarts of water to boil in large saucepan. Add beans and salt and cook until tender, about 5 minutes. Drain and add to skillet with onions. Toss to heat through, 1 to 2 minutes. Add bacon and season with salt (sparingly) and pepper to taste. Serve immediately. Bring a large pot of water to a boil and add a large pinch of salt. Prepare a large water ice bath; set aside. Drop the beans into the boiling water and cook at a full boil until they are slightly tender and cooked through, about 6 to 8 minutes. Drain, plunge into the ice water to halt the cooking process, drain again, and spread the beans on a kitchen towel. Combine the sherry vinegar, 1/8 t kosher salt, pepper, walnut oil, and olive oil in a large mixing boil. Whisk vigorously. Add the chives, parsley, and shallot and mix well. Drop the figs, beans, basil leaves, and walnuts into the bowl, and toss together gently but thoroughly with your hands. Sprinkle the salad with a pinch of salt and, if desired, garnish with the thinly sliced summer truffle. Serve immediately.